Aged 4, I started attending a Catholic primary school. My family had all been raised as Catholics, and decided that the same should happen for me. Age 5, teachers started explaining to us what Christianity was all about. However, by the time we’d started learning prayers, putting on Nativities, and giving up crisps for Lent, I’d already formed my own idea of what Christianity was. Before the adults in my life shared what Christianity meant to them, I’d learned all about it through my favourite TV show, The Simpsons. 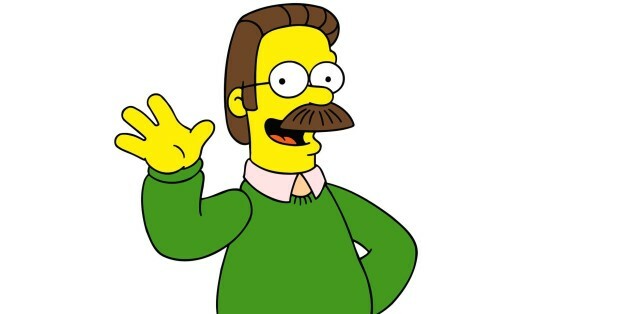 More specifically, I learned that Ned Flanders was a joke. He didn’t just go to Church, he let the Church become his whole identity. His chipper attitude and sing-songy catchphrases wound up Homer and Bart, so they wound me up too. His kids Rod and Todd were unlike the less devout kids in the show. They were creepily obedient, devoid of individuality, and emotionally vacant. For them too Christianity was the most significant part of their identity. Their personalities, appearance, and even their names made them otherwise indistinct. There’s also Reverend Lovejoy, whose arrogance, self-righteousness, and blatant hypocrisy make him the exact opposite of what his name suggests. The old primary school did their best to instil in us a love for the Church, but before they got the chance Springfield’s finest had helped make up my mind. The Simpsons treated religion the same way it treated just about every large subject: by showing us an example, exaggerating its faults to the extreme, and then poking fun at the result. This approach is almost systematic, and is reflected in a number of characters: Mr Burns is extremely evil, Barney is extremely alcoholic, Radioactive Man is extremely radioactive, and so on. In one episode, Ned reads Harry Potter to Todd, but changes the ending so that the characters go “straight to hell for practicing witchcraft”. At this, Todd throws his hands in the air and cheers, so indoctrinated in Christian ethical teaching that the thought of schoolkids burning for eternity fills him with joy. Clearly, the Flanders clan are a caricature of real-life Christians, and not the best example of a Christian family for a young boy only just starting to learn about religion. At this point I’d like to be blunt: I love The Simpsons, and despite everything I’ve said so far, think it handles the topic of Christianity with nuance and good intention. The episode ‘Bart Sells His Soul’ sees Bart sell his soul to Milhouse, believing the soul doesn’t exist, only to find that the idea of living without a soul makes him deeply unhappy. While not advocating any particular religion here, this episode acknowledges the human need for a meaningful existence which religion can cater to. ‘Lisa The Sceptic’ on the other hand sees the whole of Springfield descend into a religious frenzy, destroying laboratories and museums after the discovery of an apparent ‘angel’ skeleton. Lisa goes on TV and implores people to be scientific and “face reality”. The ‘angel’ turns out to be a hoax. The Simpsons doesn’t have any explicit anti-religious or anti-Christian agenda – if it did this would have alienated a huge proportion of TV viewers, and it never could have become one of the most popular shows in the world. As we can see from the contrasting messages of ‘Bart Sells His Soul’ and ‘Lisa The Sceptic’, the show is less interested in taking down religion than it is in ridiculing it, like any other topic, for the sake of finding some truth and making people laugh along the way. Going back to the Flanders family, it would be wrong to say that mercilessly poking fun at this Christian family equates to The Simpsons poking fun at all Christians. The show is full of Christian characters who, like the Christians I grew up around, are perfectly rational and likeable. Furthermore, there is a knowingness to Ned’s absurdity that makes it clear he is supposed to be satirical, and not realistic. In ‘Hurricane Neddy’ he says “I’ve done everything the Bible says — even the stuff that contradicts the other stuff!”. This is something The Simpsons does well – at some point, every character has been able to make fun of themselves. I remember this line particularly resonated with a young me, not just because it was funny, but because it put into words exactly what I’d been feeling for a long time. Sat cross-legged on the floor of our living room, aged maybe 7, I had what was probably the first existential crisis of my life. I’d long had suspicions about things our teachers and priest taught us, and in this one moment my suspicions were confirmed. The Bible wasn’t unquestionably true after all! It felt like validation. Suddenly it felt okay to ask questions. Like Bart Simpson, I was going to be sarcastic and cool, I was going to challenge authority, and I wasn’t going to give a heck what people thought. So fast-forward to the next Sunday, Church service has just ended, and for some reason my family find ourselves talking to Father Kevin. I decide to try out the new Bart Simpson charm I’ve learned. When there’s a lull in conversation, I interrupt with a clever (or as some might say, “smart arse”) joke: “Father Kevin, if God is so strong, how come he needed to rest on the seventh day?”. (NB: I realise now that this isn’t strictly a joke). To my surprise, Father Kevin does not laugh. In fact he looks very serious. He scowls down at me, then accusingly up at my mum. To my shock, my mum is telling me off. Oh no. This isn’t what was supposed to happen. When Bart Simpson says this sort of thing it’s funny, and people think he’s cool. Father Kevin does not think I’m cool. Father Kevin thinks I’m a troublemaker. I tell you this now not because it’s relevant, but because it is a burning injustice, and a decade later I’m still not over it. The Simpsons taught me to challenge authority, and do so with a bit of humour. Father Kevin was clearly not down for a laugh. As far as I’m concerned, Father Kevin can eat my shorts.